“A day passes, another day arrives. Sky Watch Friday is the best kind of day full of views of the sky from all over the world. My card making friends often ask for ideas on how to make nice ‘guy’ cards, aside from the usual browns and cars and golf how can you make some thing masculine. 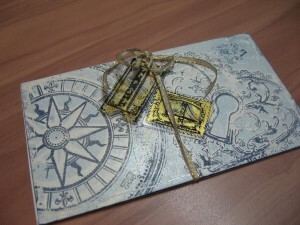 This is a card I am making for a sweet friend on the theme of journey to love. A combination of Tattered Angels Compass & Timeless Romance screens and stamps on their embossed postcard chip tile and tinted in shades of Waterslide. To make things just a bit more meaningful, the addition of postage stamps from special places or tickets from events is just the perfect touch. Wishing everyone a happy Valentines Day. Very nice shot. Lovely combination of colors in the sky. Beautiful skywatch photo! And a very pretty scene! Love the softly lit sky! I couldn&#39;t take my eyes off of this beautiful photo! 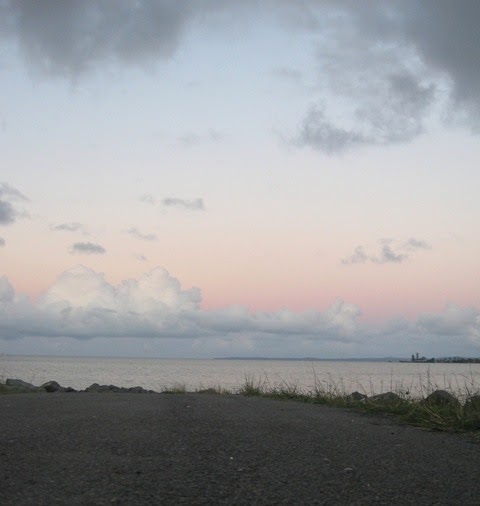 And those pink clouds made me smile–thanks for sharing the beauty. Beautiful colors, it seems so peaceful. Thanks for sharing. the soft hues make it appear so peaceful. The scenery with those hues gives me a tranquil feeling. Thank you. I agree it&#39;s the best day as we get to see the world&#39;s skies as one. Such beautiful pastels. beautiful serene colours in your sky! Just a touch of pink to add color to your great sky shot. Today will be meaningful to me as I am visiting my poor friend who need a shoulder. Thanks for these kind words which I will pass on to her. Beautiful sky, with the red glow. Beautiful SW scene. Have a great weekend ahead. It&#39;s interesting how there is often a line of clouds parallel to water. Mandy: what a beauty with the pink above the white cloud, nicely done. Wow amazing one!<br />Happy weekend. Gorgeous! Just love the pink in the blue sky. What a beautiful pastel scene, I love this photo. Oh, this is ravishing. I love this photo, and thank you for sharing it.